Last Friday Ryan, my parents and I left home at 5am and travelled to London for London Film and Comic Con! Which is one of the biggest conventions in the UK and one of my favourite events as they have a wide range of celebrity guests attending and unique dealers. We got to the venue at around 7am and there was already a queue forming; rumour has it some people had been there since 5am! Once inside the convention we headed to the guest signing area on the first floor to collect our virtual queue (VQ) tickets. It is never known for sute what guests will be operating a virtual queueing system but it’s usually reserved for the ‘big’ guests and this years biggest (in my opinion) was Jeremy Renner (Marvel’s Hawkeye), so that’s where I headed first while Ryan focused on the others – Kim Coates (Son’s of Anarchy) and Sean Maher (Firefly), we also picked up Rutger Hauer VQ tickets for my dad. The other guests I wanted to meet were Saturday and Sunday only. As I’ve mentioned before a VQ ticket is like a raffle ticket, you’re given the ticket and then told to come back later to join the actual queue. Tickets are usually called in batches of 100 and the lower the number the better chance you have of meeting the guest (hence getting in the queue so early!). After our mad dash for VQ tickets we headed back downstairs to look at some of the dealer’s stalls. I must say that this year’s show was a lot better laid out than last year, taking up two halls in the ground floor, the celebrity guests on the first floor and author signings on the second floor. Last year everything was over more cramped and you struggled to move within the crowds. It felt quieter as a result but we’re told they were expecting 16,000+ people through the door Saturday in pre-sales and were selling more tickets on the door too. He was really nice, signed an 8×10 for me with a Stargate quote on it “Hallowed are the Ori” and signed inside my copper Stargate journal. He wasn’t as chatty as other guests but answered my questions and wished us a nice day. I’m happy we met him, he’s a very iconic character in SG1. It was clear from the slow reactions that he was very very let lagged. He told us he’d arrived the night before from the US so probably should still have been in bed! I did see him around on Saturday and he seemed a lot perkier, so hopefully he got a good night’s sleep Friday night. Even though he was so tired, he was friendly and willing to have a conversation. I chose a Scream 8×10 for him to sign and he added ‘What’s your favourite scary movie?’ on the photo. Really happy with the autograph and for the chance to meet him as I’ve been a Scream fan for many years. I finally got to meet Sean! He’s previously been announced for 3 events I’ve gone to in the past and scheduling conflicts meant he had to cancel them all, so I was very excited to meet him. He was very shy. But was genuinely interested in what I’d brought him to sign (a copper journal with Serenity (the ship) engraved on the front and images of the cast members on the pages). He had a flick through and a good look at the cover before asking if I had made it, unfortunately not! But he was still really interested in the book. I don’t think any guest I’ve met has greeted me with a hug and as if we were old friends but that’s just what Kim Coates did. He loved that we share the same first name (and the same initials – KC) and wrote that on my autographed 8×10, along with drawing a kiss on his neck in the photo. 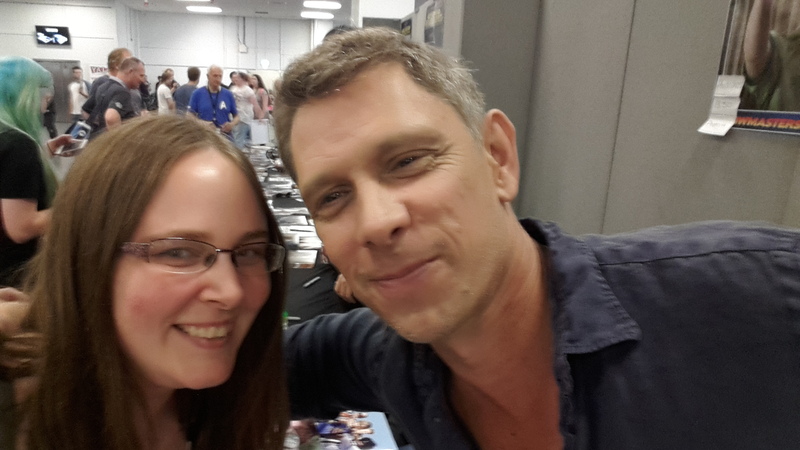 I hope I get to see him again at a future event… Maybe Reaper’s Lot (a London Son’s of Anarchy convention) next year. 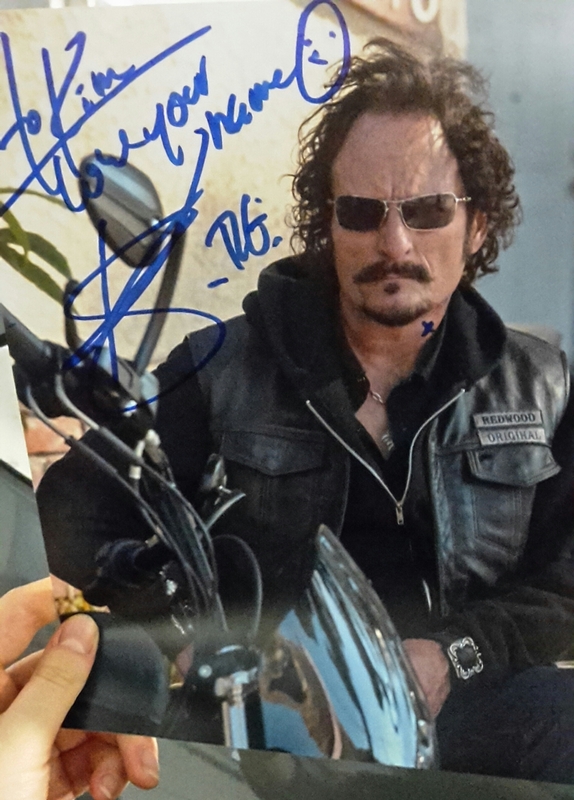 We went to a talk with Kim Coates to finish of our day, he’s interesting to listen to and very proud of his work on Son’s of Anarchy, especially his scenes with Venus (character) and his on screen daughter. Jeremy Renner, unfortunately had to cancel his Friday appearance so we didn’t get to meet him but he was definitely attending Saturday and Sunday so we had two more chances to see him. We also were unable to meet Rutger Hauer as we had high VQ ticket numbers (300) and they hadn’t called our numbers yet. 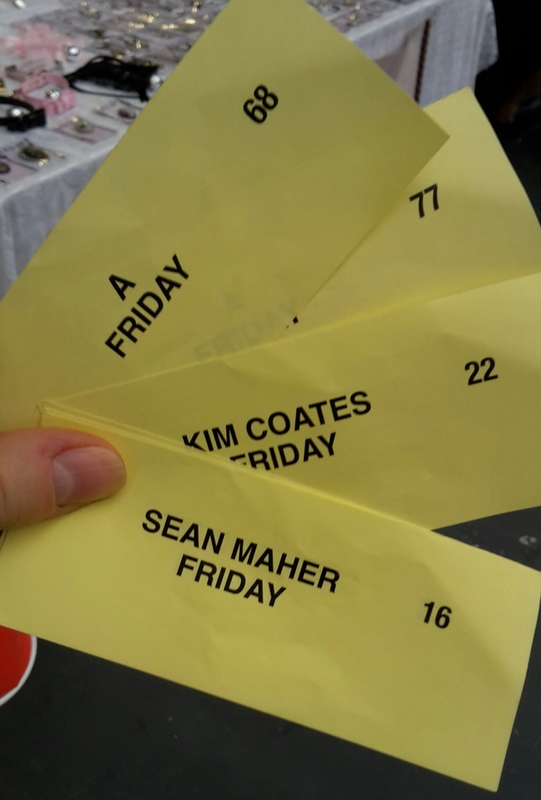 Unfortunately the tickets are not resuable so we would need to try again on Saturday and Sunday. 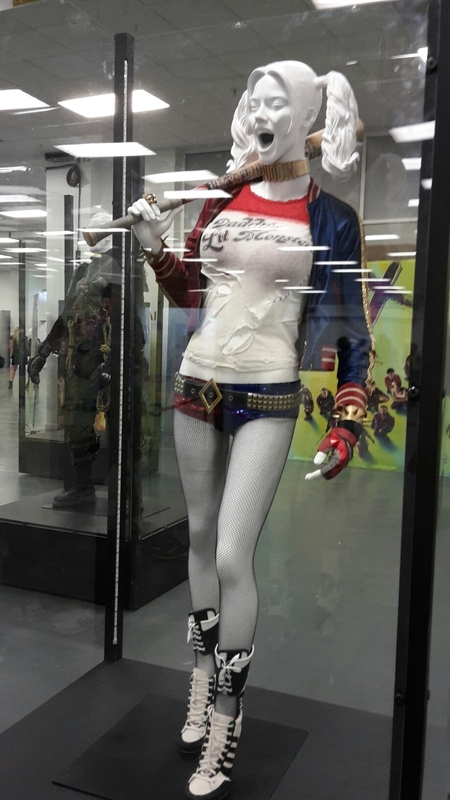 At the convention they had some screen used costumes from the upcoming Suicide Squad film along with a couple of Batmobile’s, the Tim Burton one and The Tumbler. At the event there were opportunities to have a professional photo shoot with some tv and movie props. This year they had the bike from the newest Dredd film, a Doctor Who Tardis console, the Emperor’s throne from Star Wars and the Game of Thrones iron throne. Ryan, dad and I had a family photo shoot around the Tardis console (mum decided not to) and it is one of my favourite photos from the convention and definitely one of the best prop photo shoots I’ve had. I love it. 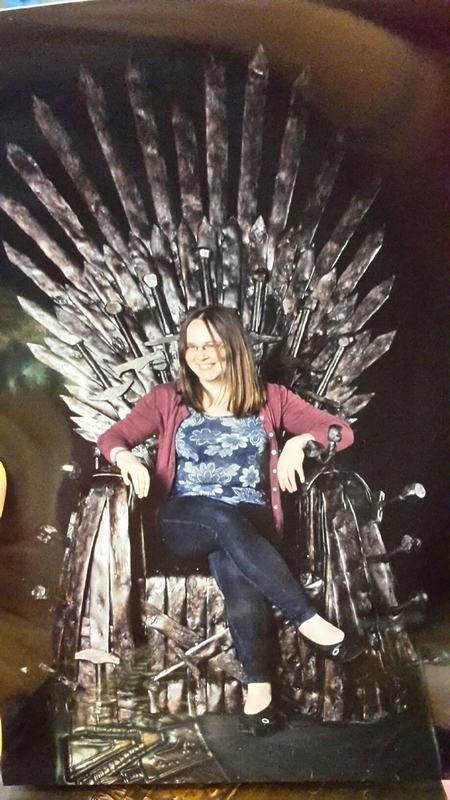 Ryan and I also had separate photos taken sat on The Iron Throne, I really love how mine came out. The new Queen of Westeros? – Excuse the blurriness(! ), it’s a photo of a photo. As soon as the digital copies are released I’ll replace it with a better copy. In the main dealer’s room, Cex who have game and film stores across the UK were there promoting themselves and were offered to photo competitions, one with a monster and one on a chair which looked like a hamster! Ryan, mum and I had separate photos on the chair – mine is unflattering! Sometime Friday afternoon mum and I checked into our hotel, the rooms were spacious and offered great city views. It was also a stones throw away from the venue which was an added bonus. We had dinner and drinks there Friday night, the menu was small but thw food was lovely. I had a cajun spiced chicken burger for my main. Ryan decided months ago he wanted to dress up at least one day of London Film and Comic Con as The Flash from the new tv show and, due to The Flash and Supergirl cross over on Supergirl, I decided to join him and dress as Supergirl. Or, at least, that was the plan! I had costume issues 2 weeks before the convention where I was told I could borrow a costume but was let down last minute. Then the replacement parts for my costume never arrived in time; they should have according to the delivery promise by the seller but that’s another story. I still wanted to dress up with Ryan so we did a bit of late night shopping, picked up a Superman tshirt from the boys section and a wide black belt and I became Kara Danvers / Zor-el (Supergirl’s alter ego). Although it’s not the costume I was planning on, I’m really pleased with it and will be cosplaying Kara Danvers again in the future. I’ve already got a Catco name badge ready for next time. 🙂 I’m also working on my Supergirl outfit for next year. Today was the main signing day for me as I had photo shoots tomorrow which meant another early start for VQ tickets… We started queuing around 6.45am(!) and enjoyed breakfast rolls from “Franks” (a local sandwich bar next to our hotel) while we waited. Although I had planned to get the majority of my signings on Saturday and even though we had really low VQ ticket numbers for everyone to achieve that, it didn’t pan out. We were very unlucky in that guests were away from their desks (either in a break, lunch or at a photo shoot or a talk) whenever we went to meet someone and by lunchtime we’d met 1 of 7 guests! She gleefully told us she was feeling giddy from a mix of caffeine and sugar (jelly babies – which was the 4th Doctor’s favourite sweet by the way), happily signed my 8×10 and then was rushed off by the crew members. I’m assuming to a photo shoot, so we only just caught her. Happy I met her but disappointing we couldn’t have a longer chat. At 2pm-ish Ryan, dad and I went to the Game of Thrones talk. It was very random and I didn’t think it flowed to well but that’s mainly due to the type of questions that were being asked. I think it should have been called a Q&A rather than a talk. One of the highlights of the talk were listening to Hodor and Joffrey talking about their characters and their exists from the show. After the talk dad and I went to queue to meet Tobin Bell (Saw movie franchise) and proceeded to stand in that queue for the next 2 hours or so! It was a shambles. The crew member managing the queue did so very poorly and misjudged how many people to let in the queue knowing Tobin was due a break soon and a photo shoot later that afternoon. Normally the crew do not take your VQ ticket from you unless your meeting the guest in that time slot, as it happened he took our VQ tickets and shortly after we were told his queue was closed so he could have a break and to go away and come back. I would have been more than happy to but we can’t get back in the queue without a VQ ticket. Doh! The crew member told us and the 4 gentlemen in front of us and the few people behind us to wait by the wall and we’d be first in the queue when Tobin returned. 🙂 … Or so we thought. Six people that were far behind us all in the queue came forward and decided to queue jump. No crew said anything to them. Needless to say the four gentlemen in front of us and the couple behind us were unhappy, especially as we had been told to wait by the wall and a new queue had started to form. A head crew member arrived and I explained the situation to her for our little group, she assured us we would be first in the queue once Tobin returned, and we were. Unfortunately, dad and I were next at his signing desk when he left for his photo shoot. 🙁 We were very unlucky with scheduling on Saturday! Shortly after that conversation mum called me to day we’d “been called”! I was about to meet Jeremy Renner! Queue fan girl moment and a fast walk (“no running in the hall”) to his signing area. Jeremy Renner was so down to Earth and genuinely interested in what I had to say. 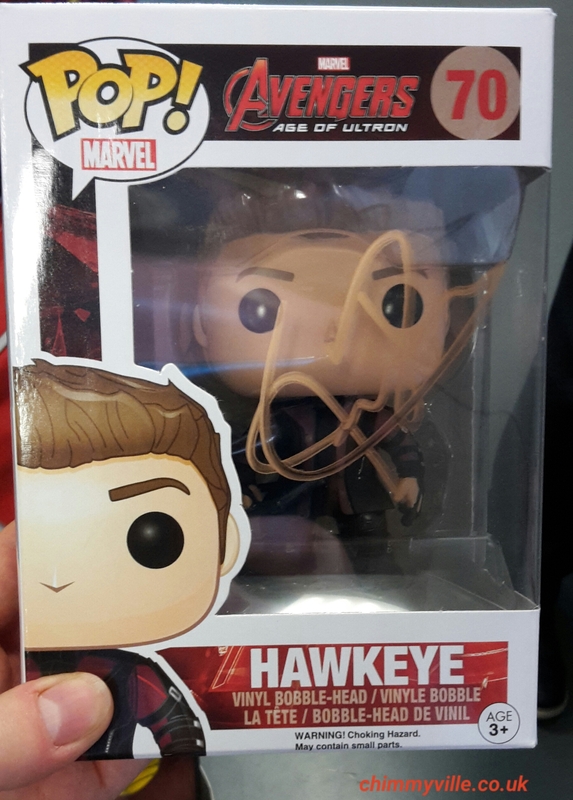 The meeting was bride as it usually is with the “bigger” or more popular guests but he was more than happy to chat and sign my Hawkeye Pop Vinyl figure and my mum’s too. I wish I had bought a photo shoot with him now. There wasn’t much time for anymore autographs, most of the guests had either gone for the day or were at photo shoots or talks, however, I did manage to meet Judge Reinhold (Beverly Hills Cops, Gremlins) before he left. He signed a Gremlins 8×10 for me and told me how it was working on the film with all those little monsters around. 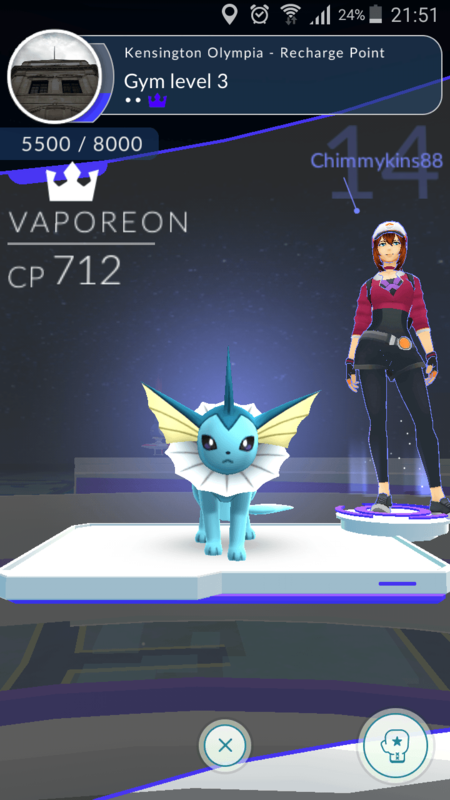 Saturday evening we had a few drinks in the hotel then dinner in Pizza Express, we got a little tipsy and Ryan and I took over a Pokemon Go gym near the convention venue. We were hoping for a lie in on Sunday and for a more chilled day, but as I sill had a lot of autographs I wanted to get that didn’t happen and Ryan and I joined the queue at 6.30 for another round of VQ ticket collecting, followed shortly after by my Sean Maher photo shoot. The first guest we met Sunday morning was Dominic Monaghan, he signed an 8×10 of Merry (Lord of the Rings ) for me and my dad brought a Lord of the Rings pewter goblet for him to sign and he was really sweet, we had a chat about the goblet and he was concerned he’d ruin yt with his autograph or that he’d mess up signing it. He didn’t and the goblet looks awesome with his autograph on it. He gave me a sticker that said ‘Be Curious ‘ on it. Rutger Hauer was not on my original list but I decided to meet him and got an 8×10 from the Buffy the Vampire Slayer movie signed, he played Lothos, the main bad guy in the movie. I’m not too familiar with Blade Runner but my dad got him to sign an 8×10 of his harasser holding the bird, he says it’s an iconic scene towards the end of the movie and told Rutger he thought so, who agreed. Rutger told me he liked working on the Buffy movie. Jamie Haris was very friendly and chatty. I brought two Agents of S.H.I.E.L.D items for him to sign and also chose an 8×10 photo of his character to get signed as well. He happily signed all three items and I’m really leased with them all. I was going to ask him about the makeup process on the show (his character has no eyes / his eyes are covered by a layer of skin) but got caught up in the moment and forgot. After a busy morning of signings we went to the comic book zone and I got a signed comic book by Georges Jeanty who is a Buffy season 8 and Firefly artist. He also, kindly, drew a custom Willow drawing on the comic I remember telling him how awesome it is. Before heading back downstairs I stopped at the prop photo booth and had my photo taken sat in the Emperor’s throne from Star Wars. I really like how the photo came out. We did some more shopping and watched some of the cosplay masquerade before Ryan and I headed off to our photo shoots. He had one with Carl Weathers (Rocky, Predator) and I had one with Kim Coates, I asked for a hug pose and he happily obliged. After the photo shoots we looked round he stalls a final time and I had my photo taken with a Star Wars Stormtrooper in a mock up toy display case. The money from the photo op went to the ‘Feel the Force’ charity. This year’s London Film and Comic Con (LFCC) was one of the best I’ve been to so far, it was very well organised overall and the guest list was perfect for me. I enjoyed the optional extras such as the prop photos but there wasn’t enough time for us to visit the authors on the third floor. We missed out on this last year to so I think a half day event, perhaps Thursday evening would be beneficial. I know they were looking at doing that this year but, for whatever reason, it fell through. There were other zones at the convention we didn’t get to spend much time at including two game zones (one for video games including an extensive collection of retro consoles and the other for board games and card games) and a virtual reality zone. It would have been nice to spend more time in those areas. I’m really looking forward to going again this time next year. Ahaha, you definitely look comfortable in the iron throne! It looks good on you. I am sorry to hear about the mix up with Tobin but VERY glad you got to meet him in the end. Phew. Very jealous you met Merry! So awesome. Haven’t heard of him doing much lately, so glad he’s visiting cons. It sounds like you had a great time! 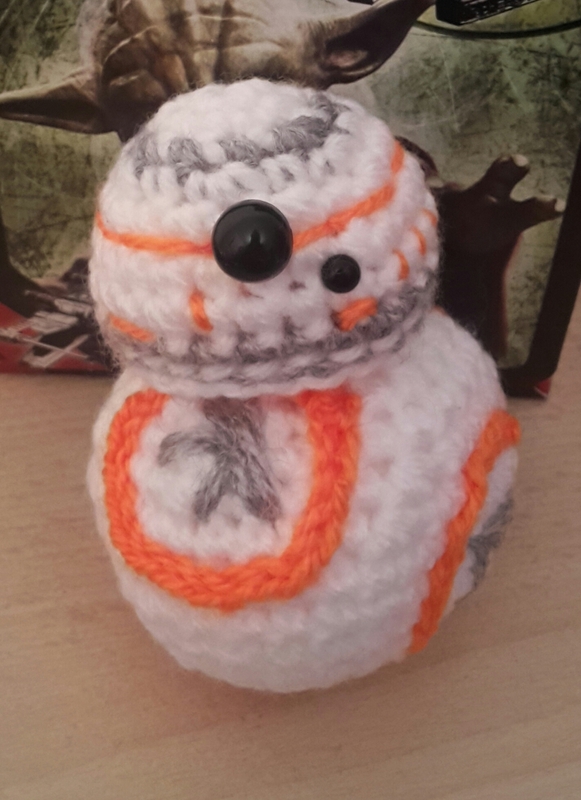 I love your little crochet BB-8 <3 I hope you enjoy the con again as much as you did this year.